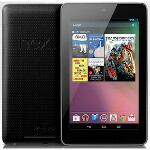 The Google Nexus 7 tablet has seemingly already become a success even though it hasn't officially hit store shelves. As we've heard, Nexus 7 pre-orders have already sold out, but of course as we also know, Google isn't making much if any money on the tablet. Of course, just like the Amazon Kindle Fire, the Google Nexus 7 isn't supposed to make any money on the hardware; the point is to get more and more people hooked in to the Google Play Store and to push media and app sales. The trouble is that the Google Play Store still doesn't quite match up to the competition, so we have to look into how well this gambit will play out. People tend to assume that everything that Google does is a way to maximize advertising revenue, which is often true, but this time we can't say that it is. Sure, getting an inexpensive Android tablet into the hands of millions will help Google get more ad revenue, because of the increase in eyeballs, but this time, we think Google is looking past ad revenue at the entire Android tablet ecosystem. Ultimately, that has always been the point of Nexus devices. Nexus devices have historically been designed to be reference devices that not only show off the abilities of stock Android, but also to show hardware manufacturers ways to best take advantage of the platform. To that point, Google seems to want Android manufacturers to build more inexpensive tablets, but there is also a new aim for this Nexus device: consumer activity. Google obviously wants the Nexus 7 to get into as many hands as possible, and immediately it is clear that the focus of the tablet is the Play Store. It even says right on the box that this tablet was designed for the Play Store, and those who buy a Nexus 7 get a $25 credit for the Play Store to push people even more. Advertising revenue is one thing, but having a viable content store that users frequently purchase from is a proven way to not only bring in revenue, but also to push hardware. Both Apple and Amazon have proven that, and Google wants to push forward the entire Android tablet ecosystem, not just its own ad revenues. Both Apple and Amazon put in a lot of work building up their respective content stores before putting out a tablet. iTunes and Amazon each had huge amounts of music, video, and books before launching their tablets. Apple had a ton of apps available for the launch of the iPad, and although Amazon didn't have that many apps, its Appstore was carefully curated to make it easier on users to find what they wanted. More importantly, each company had a history built up with users, so each company already had the payment information for users. Even Barnes & Noble already had payment information, so users didn't have any barriers to purchase. Google still doesn't really have that relationship with a lot of users. The hope obviously is that the Nexus 7 will sell well because of its price point (and we've already seen that plan appears to be working), then people will put their information into Google Wallet for use in the Play Store. The first thing you'll notice on starting up your new Nexus 7 are the big new widgets used to showcase the Play Store and its content. But, at the end of the day, this is a proper Google Android tablet, and not a customized experience, which actually is problem for Google. Because this is a proper Android tablet with the entire Play Store available, that means users can simply install services that they already use and pay for like Amazon for books, Netflix and/or Hulu for video, Spotify, Pandora, or MOG for music. So, even though those same apps were available to iPad or Kindle Fire users, Apple and Amazon already had user payment info. This made it just as easy for users to get content directly from Apple or Amazon, while 3rd party services have a bit of an edge on Google. If you'll indulge us a minute of conspiracy theory, one could make a case that Google is holding more Nexus 7 stock itself, or is at least giving itself priority with Nexus 7 stock, even though there may be more demand through Staples or Walmart. This would drive people to purchase the tablet in the Google Play Store, which would force a new user to add payment information. Of course, we have no way real reason to believe this is true, other than the fact that the Play Store is the only one around that hasn't sold out of the tablet. And, that could just as easily be explained by the fact that there are likely to be fewer people purchasing through the Play Store simply because they don't have their payment info set up with the service, which is exactly the problem Google wants to fix. All that to finally bring us to the catch-22 of it all. Google can't get user payment info data into the Play Store if the tablet is purchased anywhere but the Play Store itself, but users will be less likely to purchase from the Play Store because they don't have payment options set up, and even after purchasing, 3rd party options take away the need for payment in the Play Store. The Google Play Store has a lot of good content, maybe not as much as the competition in many areas, but there is a lot of good content, especially in the app market, and if you like to discover more independently produced music. Those of us already invested in the Play Store are the ones most likely to purchase a Nexus 7 from the Play Store itself, so that doesn't give Google any new information that it didn't have before. The real challenge is to get those who buy the tablet at Walmart and Sam's Club to set up a Play Store account. The new widgets will most likely do a fairly good job of doing just that. Even if people have their information with Amazon doesn't mean that they are invested in the Amazon Kindle store, and may not bother to really download many apps. These kinds of people are the prime candidates for consuming media via the Play Store. So, if our silly conspiracy theory is right, it may work against Google by not getting the Nexus 7 in the hands of those who don't have Play Store accounts. Either way, the tablet seems to have enough buzz that if Google can keep up with demand, the whole equation may not matter because Google's plan will succeed just by sheer numbers. If successful, this could represent a sea change for the Android ecosystem. More people will viable payment options in the Play Store means more people purchasing apps; and, more people buying apps will mean developers will put in more effort to build up the tablet selection in for Android, which still needs more attention from devs. It's a move that Google had to make, even if just to kickstart the entire Android tablet ecosystem. The plan is off to a good start, and pushing demand is always helpful for a new launch. But, Google has to make sure that there are enough tablets coming out fast enough that demand doesn't turn into exasperation, because that's when people walk away. I want one! $199 is the sweet spot for a good quality tab! Another goal is to get the whole android tablet ecosystem going - get a lot of these in the hands of people, then DEVELOPERS will follow. That way, stupid Tim Cook can't s**t on Android about a stupid app called "Twitter". I think the author is KINDA on point, but how many purchases do people make through the Market/Playstore previously? Heck, with that Google Checkout (now wallet) and all their other services (i got 20gb cloud storage for 5 bucks yearly) i think the "payment" argument loses steam. As far as losing to netflix type of services well...did we really think selling movies was Google's game? No...get users using your roads (search and services) so you can remain data king...and for that you need the Android Tablet marketshare to be strong.... Just my cents Bay Bay! exactly, the point is not to get profit from the hardware (eventhough they might be getting a little), and not even from playstore sales (which again they might be getting some), the two main points is to get people involved in google ecosystem and improve android tablet sales. in addition, people would be using google maps, search and more importantly GOOGLE ADDS (as we all know googles main source of income is the ADDS). so it is win win for google and for the customers. I don't agree. It's a good point, and I've edited the article accordingly, because I can't believe it's something I didn't touch upon. Essentially, this move is bigger than just ad revenue. This isn't a move just for Google, this is a move for the entire Android tablet ecosystem, which needs a kickstart. And, to do that you need to attract developers, and increase developer interest, and you do that by getting people more active in the content store. i got shipping confirmation yesterday. cant wait... even though its still an anniversary present for the wife.. lol. I think a very simple solution to the Google Wallet problem is make adding a credit card part of the sign in/set up process when you get the tablet. Putting it front and center (even though there would be a "ill do it later" button) would get a lot of people to put in the CC right then n there. Honestly, they should put that in the phones too. Even if 1/10th of all new activations do it, thats a huge number increase. Hmm... well, there was some kind of report about the possibility of Amazon and Google talking to each other. Perhaps they've both realized that teaming up Amazon's purchasing power with Google's search capabilities is the way to go instead of each company spending the resources to maintain their own separate devices. Basically, you'd have a "Nexus with Special Offers" device. Well, to me it's all about consumption of content, whether they'll be apps, games, movies, books etc. Google didn't cease to support sideloading content, not only apps but also media files. You can access your files from any cloud service or home based multimedia server. Just because there's no USB connectivity or support for removable memory cards doesn't mean that you are stuck with the content offered in Play Store, thanks to open source system you can still enjoy your favourite content even when it's unavailable in Play Store. And in my opinion this, apart from smaller amount of offerings in comparison with other stores, is the main point why Google may fail in gaining its customers payment info. If something is missing in Play Store I can still buy or pirate it somewhere else without the need of changing platform or device. I"ll just sideload it on my Android tablet and I'm good to go. agree with the 3G, but will pass 5MP camera for a microSD slot instead.. I don't need a camera in a tablet (which will make me look stupid holding it) and prefer to have ffc instead of bfc..